mild jaundice due to increased amounts of unconjugated bilirubin in the plasma without evidence of liver damage, biliary obstruction, or hemolysis; thought to be due to an inborn error of metabolism in which the excretion of bilirubin by the liver is defective, ascribed to decreased conjugation of bilirubin as a glucuronide or impaired uptake of hepatic bilirubin; autosomal dominant inheritance. Mild form of the hepatic disorder due to increased amounts of unconjugated bilirubin in the plasma without evidence of liver damage, biliary obstruction, or hemolysis; thought to be due to an inborn error of metabolism in which the excretion of bilirubin by the liver is defective. 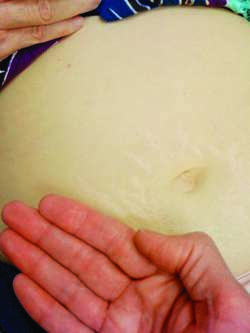 Deposits of bilirubin in the skin often cause itching. Other symptoms of jaundice depend on whether the bilirubin is direct (conjugated [i.e., soluble in body fluids]) or indirect (unconjugated). Obstructive jaundice causes conjugated hyperbilirubinemia; in this disease, bile pigments dissolve in the urine, which turns bright green, and the stool appears gray or white owing to the deprivation of bile. Tests to determine the cause of jaundice include a carefully performed history and physical exam, urinalysis (positive for bilirubin only in conjugated hyperbilirubinemia), liver function tests, blood tests for hepatitis, and abdominal ultrasonography. Invasive diagnostic testing with cholangiography, endoscopic retrograde cholangiopancreatography, or percutaneous trans-hepatic cholangiography is performed when occult biliary obstruction is suspected. The precise cause of jaundice must be determined in each patient to provide suitable therapies. For example, patients with gallstones obstructing the cystic duct need surgical treatment, and newborns with severe jaundice may require treatment with ultraviolet light to prevent kernicterus, but jaundiced patients with acute hepatitis A usually heal with symptomatic rather than specific remedies. Jaundice without bile pigment in the urine. Most of the excess bilirubin is unconjugated. Hyperbilirubinemia resulting from pregnanediol or free fatty acids that inhibit bilirubin conjugation. Serum bilirubin level usually peaks above 20 ml/dl by 14 to 21 days of age. Some pediatricians recommend stopping breast-feeding for 24 to 36 hr if the level exceeds 20 ml/dl. If the infant's bilirubin level drops rapidly, the mother may resume nursing. It typically lasts for the first week of life or until the mother produces adequate milk. Jaundice produced by failure of bile to flow to the duodenum. It may be caused by intrahepatic bile duct obstruction (as in certain drug reactions), liver cell damage (as in viral hepatitis), or extrahepatic obstruction to the flow of bile (as in cholecystitis). Jaundice occurring at or shortly after birth. Jaundice caused by the fragmentation of red blood cells and the release of unconjugated bilirubin in the bloodstream. This finding is associated with hemolytic anemia (HA). Because the bilirubin is not conjugated by the liver, it is not soluble in water and does not discolor the urine. Many conditions may be responsible, including congenital HA; sickle cell anemia; autoimmune HA (as in infectious mononucleosis or Mycoplasma pneumoniae infections); microangiopathic HA (as in hemolytic uremic syndrome); or transfusion-associated HA. Nonpathological jaundice affecting newborns, usually resulting from the destruction of red blood cells by the immature liver at birth. The destruction of red blood cells causes unconjugated bilirubin to accumulate in the blood and skin. Benign neonatal jaundice manifests 48 to 72 hr after birth, lasts only a few days, and typically does not require therapy. Jaundice due to abnormal metabolism of bilirubin or to biliary tract obstruction, and not to excessive destruction of red blood cells. The condition is marked by yellow staining of the skin, mucous membranes, sclera, and secretions. The patient may complain of pruritus caused by bile pigments in the skin. The urine is yellow or green, but the stools turn light or clay-colored because of absence of bile pigment in the intestinal tract. Acute obstruction to the flow of bile causes right upper quadrant pain and may be associated with biliary colic due to entrapment of gallstones. Cholecystectomy with common bile duct exploration (choledochostomy) is used to resolve obstructive jaundice caused by gallstones. Radical surgeries (as the Whipple procedure) or stenting of the biliary tract with or without external damage may temporarily relieve obstructive jaundice caused by cancer. Jaundice resulting from the inability of liver cells to remove bile pigment from circulation. Jaundice resulting from chemical injury to the liver or sepsis. Ferdinand von, Austrian dermatologist, 1816-1880. Mild icterus due to increased amounts of unconjugated bilirubin in the plasma without evidence of liver damage, biliary obstruction, or hemolysis.